WASHINGTON/DETROIT (Reuters) - Surging demand for trucks and SUVs fueled by cheap gasoline is holding back improvements in U.S. fuel economy and greenhouse gas emissions, a government report due out on Wednesday is expected to show. sets up a clash between the auto industry and federal regulators. Mark Rosekind, who heads the National Highway Traffic Safety Administration, said in a Reuters interview last week the administration will consider automakers' arguments that the shift away from cars makes it harder to hit the 2025 fleet average fuel economy target of 54.5 miles (87.7 km) per gallon. in bid to arrest global warming, could make a cut in the target difficult for the U.S. government to accept. "Unfortunately there have been too many decisions that are made - 'Oh, prices went down, it's OK again,'" said Rosekind. said. "No, it's not." Consumers are responding to signals from gas pumps, where a combination of relatively low taxes - federal gasoline taxes have not gone up since 1993 - and oil unleashed by hydraulic fracturing or fracking have pushed U.S. gasoline prices to an average of just over $2 a gallon - the lowest level in six years. 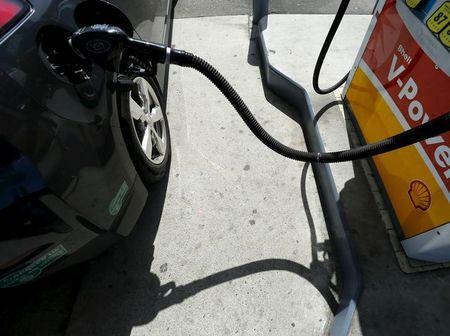 In November, fuel efficiency of vehicles purchased fell sharply to 25 mpg - down 0.8 mpg from a peak in August 2014, said University of Michigan researcher Michael Sivak, who tracks fuel efficiency. Nearly 59 percent of U.S. vehicle sales this year have been of sport-utility vehicles, pickup trucks or other larger vehicles, up from 54 percent last year, according to industry consultant Autodata Corp.
Toyota Motor Corp says within two years its RAV4 SUV will displace the Camry mid-size car as its top-selling model in the United States. Wednesday's report from the Environmental Protection Agency is likely to show that trucks are becoming more efficient, but those gains are largely being offset by the shift in some buyers from cars to trucks. Automotive fuel efficiency rules are a cornerstone of President Barack Obama's climate policy. The administration has said better fuel efficiency will cut 6 billion metric tons of greenhouse gases over the lifetime of the vehicles sold between 2012 and 2025. That is more than the total amount of carbon dioxide emitted by the U.S. economy in 2010, the administration has said. The fuel economy rules for 2017-2025 will cost the industry $157.3 billion, according to Obama administration estimates, but would save consumers as much as $488 billion at the pump assuming gas prices average $3.53. However, those goals are at risk. Federal regulators and California are working on a report, due in mid-2016, that will set the terms of bargaining with automakers over whether efficiency standards for a final 2022-2025 period should be eased, stay the same or made tougher. Automakers have met with regulators in recent months for day-long individual meetings to talk about their confidential future product portfolios and discussed how they plan to comply with the fuel efficiency increases. Gloria Bergquist, a spokeswoman for the Alliance of Automobile Manufacturers - the trade association representing major automakers. The industry group is pushing proposals to allow automakers to get greenhouse emissions credits for adding technologies that could help avert crashes. Environmentalists say automakers are not doing enough to cut greenhouse gas emissions. "They are driving up oil consumption and pollution and putting at risk U.S. compliance with the Paris global warming agreement," said Daniel Becker, director of the Safe Climate Campaign. Renault-Nissan Chief Executive Carlos Ghosn said he is not betting on relief. "I’m not expecting it to become easier," he said earlier this year.